Fifth year students from Tallaght Community School pictured preparing for their first contact with Space. They will be in contact with the International Space Station. For a brief timeframe during Expedition 52 and 53, Nespoli and the rest of the crew on the ISS will be traveling at 27,600 km/h and for 6 to 12 minutes will be passing directly over Tallaght Community School and then the following week above Glanmire Community College. In order to carry out this real-time Earth-to-space radio contact, which uses amateur radio equipment to beam a line-of-sight signal to the ISS, the schools will set up a temporary radio station on the grounds which will include an antenna, two radio systems and a back-up line diverted via Belgium or Italy, in case of interference locally, which will allow students to speak directly with Nespoli while he takes a break from his duties and experiments on board the ISS. The closer the space station flies to the Tallaght and Glanmire schools the stronger and clearer the audio feed will get. At one point during this fantastic feat of broadcast engineering, the ISS will be 400km in the sky directly above the schools. Amateur Radio is a hobby which facilitates the learning of how radio technology works, communicating with others and investigating the mysteries of long distance communication. ARISS is a global voluntary group that formalised a programme for utilising radio equipment on-board the ISS as a channel for further educating schools across the world on the work of the international space programme, life on-board the ISS, expeditions which astronauts are undertaking and amateur radio. This is a highly competitive programme that receives thousands of applications from schools across the globe. Every six months the application process opens, enabling schools to apply to be chosen as one of the select few to make space contact six or 12 months later. Schools in the home country of the specific astronaut on a given expedition, which in this case is Italian Paulo Nespoli, receive 70 percent of the limited number of these contact events a year and so for countries such as Ireland, it is extremely difficult to be chosen. 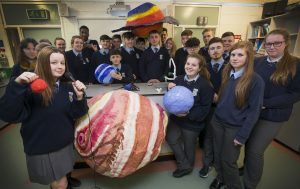 After applying for the second time to this amazing science programme, Cork ETB’s Glanmire Community College was thrilled to be successfully chosen this year due to the quality of their education application proposal, which showcased their innovation in the area of science and in particular space science, putting them light years ahead of competing schools. Their jam-packed education plan, which will be integrated into students’ curriculum in preparation for event take off, also set them apart from the competition. Tallaght Community School were a stand out choice due to their Inspiring Science Education initiative which promotes hands on, inquiry-based and collaborative learning. It provides the tools to make science education more challenging, playful and above all more imaginative and inspiring for today’s students. Teachers at Tallaght Community School are also members of the Galileo Teacher Training Programme which creates a series of professional development activities designed to help teachers and educators to learn and create resources on big topics in Astronomy and Planetary science. This ‘out of this world encounter’ will be an extra special experience for all students involved and will awaken in them an interest in a variety of ‘new frontiers’ including space, astronomy, engineering, broadcasting and amateur radio. In the months leading up to the radio contact, both schools have a brimming programme of fun and interesting events planned to prepare students. For students of Glanmire Community College this line-up includes a visit from the Blackrock Observatory Stardome mobile planetarium, as well as a host of space-themed competitions, including one to choose the questions that will be directed to the Italian astronaut. The school will be showing 3D footage from inside the International Space Station, organised through the Northern Ireland Space Office, while students from Tallaght Community School will be making trips to Dunsink Observatory in Blanchardstown and the state-of-the art Armagh Observatory. Tallaght CS was the first Community School to open in Ireland in 1972. The school has over 800 students enrolled from feeder schools in the local area. Science is taught to all students in Junior Cycle and students can chose to study Physics, Biology and Chemistry at senior cycle. For further information on Tallaght Community School see www.tallaghtcs.com. This was written by zg3409. Posted on Wednesday, October 11, 2017, at 11:20 am. Filed under Calendar Event, News, Space, Uncategorized, Video, Workshops/Events. Bookmark the permalink. Follow comments here with the RSS feed. Post a comment or leave a trackback. ‹ Phreakshow: Mobile Phone Filmmaking sessions in TOG!